Honor the valor and the patriotism of the fearless Culpepper Minutemen who fought bravely against the British in the American Revolution and celebrate the historic Culpepper flags which contain a Timber Rattlesnake with the words, “DON’T TREAD ON ME” a powerful expression of resistance to the British. It also contains the inspiring slogan “Liberty or Death” by their legendary commander, Patrick Henry, which inspired many colonial forces to fight for their rights and independence. Shop from our Commercial Grade, durable, and 100% made in the USA Culpepper Flags and get the advantage of the best prices, quick shipping, and much more! 100% customer satisfaction guaranteed! Celebrate the legacy of the Culpepper minutemen, under which the brave Culpepper Minute-Men fought fearlessly against the British Infantry. 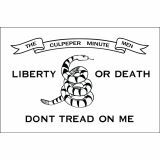 Made of heavy duty 200 Denier nylon and finished with brass grommets and white heading, our flags truly live up the tradition of the Culpepper Minutemen. 100% made in the USA, our flags are symbols of patriotism and fine craftsmanship and are made to precise specifications. The UV resistant Dupont inks and the reinforced fly ends, featured on our flags, are perfectly suited for outdoor flagpoles. Tuff Flags has a sizeable collection of Culpepper Flags in stock. Shop at your pace or should you need any tips or have queries feel free to call us at our toll free number (888) 287-3524 or email us at customercare@tuffflags.com.